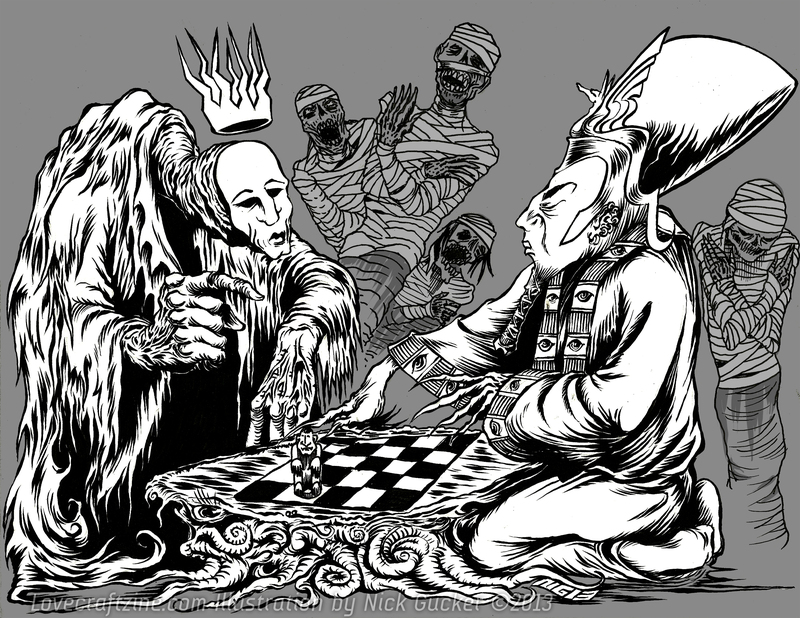 KING IN YELLOW: You seem displeased and… a bit distracted tonight. KING IN YELLOW: (Scans the board quickly for the latest pawn.) Who? NYARLATHOTEP: Excrement that requires flushing—Rawlik’s nothing more than another foulsome mouth rising to reanimate the pseudo-lies for a new generation of hacks, sycophants, and Lovecraftomaniacs. You X them out—w/ extreme prejudgment, and another appears—cockroaches. (Pause.) These things think they are of consequence, that their opinions will be taken into account, or be remembered on the pages of history. (Pause.) Batty gnats. They all think they’re superheroes that can save their brother fleas from the STOMP. 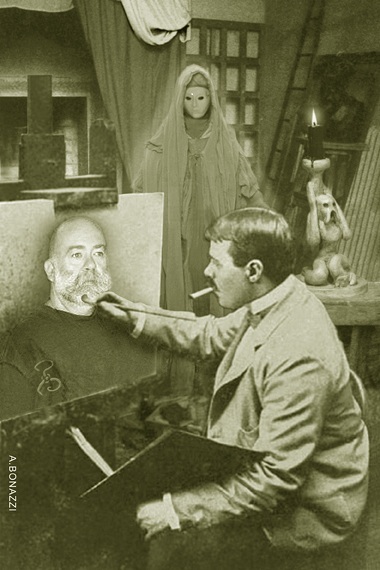 KING IN YELLOW: My Dear Boot, I can see sweet intention in your eyes. You’re going to cure Little Petey’s ills. NYARLATHOTEP: Tempting. (Pause.) Yes, that’s certainly enticing . . . But no. KING IN YELLOW: Sefton Asylum? NYARLATHOTEP: No. No . . .
KING IN YELLOW: The Great Dragons Black and Red to clear the Earth of them all? KING IN YELLOW: I’d be happy to send the Messenger to show him the Yellow Sign. NYARLATHOTEP: I have a different sentence in mind . . . Bug-Shaggoth. KING IN YELLOW: Sweet. Raw-lik, it’s what’s on the menu. Joseph S. Pulver, Sr., is the author of the novels, The Orphan Palace (Chomu Press 2010) and Nightmare’s Disciple (Chaosium 1999), and he has written many short stories that have appeared in magazines and anthologies, including Ellen Datlow’s Best Horror of the Year, S. T. Joshi’s Black Wings and A Mountain Walked, and Ross Lockhart’s Book of Cthulhu (Night Shade 2011). His highly–acclaimed short story collections, Blood Will Have Its Season, SIN & ashes, and Portraits of Ruin were published by Hippocampus Press in 2009, 2010, and 2012, respectively. He edited A Season in Carcosa (Miskatonic River Press 2012), and collections by Ann K. Schwader and John B. Ford. His new collection, Stained Translations, edited by Jeffrey Thomas, will appear in 2013 from Dark Regions Press. If you enjoyed this story, let Joe know by commenting below — and please use the Facebook, Twitter, and Google Plus buttons below to spread the word. Hey, Joe…don’t look now, but I think you’re in check! Ah so that is how it happens. Good luck Mr Davis.